The business at the corner of 18th and O streets has a lot going for it, not the least of which is its location in the burgeoning Eastchester area downtown. It joins fellow dining establishments Cafe Smitten, Angry Barnyard and Goose Loonies, as well as the soon-to-open Metro Galleries along the 18th Street corridor. And it's in easy walking distance to the 17th Place townhomes, an eager customer base ready for breakfast, lunch or dinner as well as picking up some quick groceries or a bottle of wine on the way to a dinner party. But Dot x Ott isn't just about being in a good location; it's meeting a need in the area for a grocer. Of course, the project started much simpler, when Jeremy and Jessica Blackwell were looking for a possible storefront for their toffee business. Jessica Blackwell said after the birth of their first two children, she was itching to get back to work on something. "Being a stay-at-home mom is nice but I wanted to do something more." Finding the space, which is split between Jeremy's office for his farm management business and the shop, was the first step. Both passionate about food, the Blackwells considered what might work in that space thinking a market would be ideal. With a desire to seek out local produce, they reached out to Mary Jean Russell, who owns Pickalittle Farms with her husband. Jessica Blackwell said, "We asked if she could grow produce for us and she laughed and said 'no.'" That became a resounding yes when their new partnership allowed them to purchase 15 acres adjacent to the existing farm to grow crops just for Dot x Ott. The farm is also in the process of being certified organic. The spring crop, which includes strawberries, carrots, beets, radishes, turnips, sugar snap peas and specialty greens, is being featured in the seasonal menu as well as in the mercantile. "As a small farmer, this is what you strive for: to get a restaurant to highlight your produce," Russell said. "Local is huge to me, to keep this product here. What we grow, we grow for Bakersfield." "When one of us succeeds, we all succeed." Anyone new to the product will find it highlighted in a menu designed by head chef Take Kato. Options include the Dot x Ott toast ($11), with strawberry cream and spiced candied bacon on buttered house-made brioche and the charred garden bowl ($13), featuring a variety of charred vegetables along with herbed quinoa and lemon cilantro yogurt. Dinner brings hearty options including a short rib carrot risotto ($21), with spring vegetables and Redhouse beef, and blackened Cajun halibut ($26) with greens and spring vegetables. When it comes to proteins, local purveyors Red House Beef and Ayden's Eggs are featured on the menu as well as on the market side. When it comes to pork and seafood, products are sourced as locally as possible, such as Rancho Llano Seco pork out of Chico and a sustainable fish provider based in Ventura offering fresh catch off the California coast. Diners can order at the counter, offering "fine cuisine without the pomp and circumstance," Blackwell said. If they're shopping for milk, bread and other staples, they also bring those items to the counter. The grocery side features a mix of locally produced products and favorites of the Blackwells, like Becquet caramels out of Montana. Local brands include Brother Ray's Salsa, Gino's Gelato, Dionysus Brewing Co., Tlo Wines, Bear Food Paleo, Sweet Tree Farms, Sweet Nine Bakeshop, KR Woodworks and Soapterra. 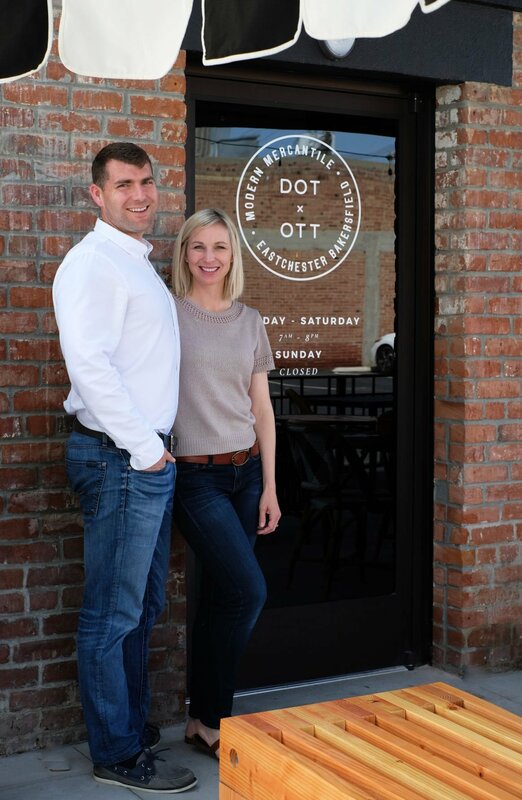 In addition to a grand opening in May, there is more in the works for Dot x Ott, including events at the farm and entertainment on the patio, but for now it's just meeting the needs of downtown Bakersfield. "This is our fourth child," Blackwell said. "We're in the crawling and exploring stage. The big part is done."